Bavaria RWC or RCW Triangle Porcelain Mark With Flower:- Hello, I have been looking for days and all I can find on this mark is Bavaria RWC , what I would like to find out is, Who made this, ..?? Many thanks for your photos, good work and a very good reference for all searching for similar information on RWC or RCW Porcelain Mark, Bavaria. As I say, I am not an expert in this area, but I try my best to help. 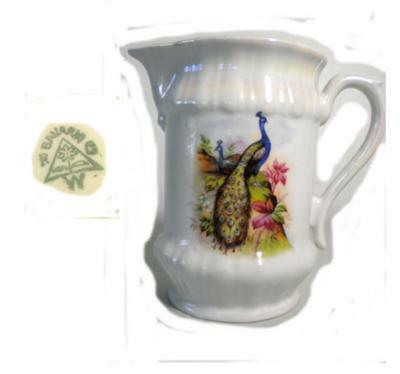 Normally, the authority on this type of German / Bavarian porcelain mark is a website called www.porcelainmarksandmore.com - but sadly their site is not easily searchable and also isn't interactive like this one is where we encourage quality user-generated content. I have also noticed that more and more pages of pm&m.com are going over to a 'paid-for' system where you have to donate to the site in order access the content. I prefer sticking on a few Google ads, which then helps to pay for the site admin & upkeep. with them, which surprised me. I found nothing in Kovels under triangles marks either. Google searches were also not too helpful. I thought this company and it's porcelain marks must therefore be quite small and obscure. I then did a bit more digging and luckily found this company listed as the Retsch & Co Porcelain Factory of Wunsiedel, Bavaria, Germany. The date of establishment was hard to pin down as various accounts say different dates. Some say founded in 1854, some 1884, some 1885 and others 1891. Some report the company as surviving to this day and others say it closed in 2006. I found an address for them, so it might be worth checking if you really want to know. This "RCW Bavaria" backstamp, is reported to have been first used post World War I. I then looked under "Retsch" in Kovels and found the same flower device porcelain mark (minus the triangle) in the 'flower section'. According to Kovels the flower without the triangle dates from the 1950's on. I have a Z S Company Bavaria decorative plate - the plate is a man ploughing with two horses. I haven't seen anything like this for Z S Company. How would I be able to obtain information and value of this decorative plate. It's very dark. I grandmother have from my deceased Grandmother a relish or sausage bowl with the RWC triangle and flower mark. It's about 10' long and 5" wide with a gorgeous male pheasant in foreground and a handsome female in rear painted inside. Would like to find more of same maker. Just wanted to add what I found online in regards to this mark. I have a creamer with this same mark. The RW stands for Rudolph Wachter, not sure what the C stands for unless it was one of his partners. Kovels does have a short article about this mark, it may be under Rudolph Wachter. I really appreciate you posting, but on this one, you made a blooper, I think. As I wrote above, this is trangle/flower mark is definitely attributable to Retsch & Co Porcelain Factory of Wunsiedel, Bavaria, Germany, not Rudolph Wachter. I checked in Kovels again, then double checked this in Rontgens, so unless both these authorities have got it wrong (possible), then we'll go for Retsch & Co.